Keeping your Missouri real estate agent license active is a simple process. This article explains the requirements and steps necessary to renew a Missouri real estate agent license. Three of the 12 hours must be a CORE topic. In 2018 the CORE topic is Fair Housing. 12 hours can be completed in approximately 12 hours. All continuing ed credits must be completed by or before September 30. There is a $40 renewal fee for both active and inactive salespersons ($50 for brokers). How Do I Renew My Missouri Real Estate Agent License? Upon completing the required 12 credit hours of continuing education, agents can renew their real estate license in either of the following two ways. All Missouri Real Estate schools have 10 days to submit students completed course credits. Once the school submits credits, the state takes up to 24 hours to enter the credits in to their system. Only once the credits are in the state system, then an agent can renew their license online. This is the simpler option. Upon completing the 12 credit hours, fill out the renewal form and mail it back to the Missouri Real Estate Commission. Include a check for the renewal fee and don’t forget to have the envelope postmarked on or before September 30th. For more info on the state renewal requirements, click here. Where can I complete the 12-credit hour Missouri continuing education courses? Continuing education courses can be completed live in a physical classroom or online through a Missouri Real Estate Commission approved school. Schools are individually approved and so are individual courses. Each course should display its MREC approval #. Can I complete Missouri real estate continuing education online? Yes! 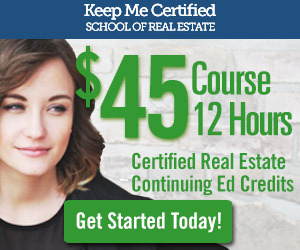 All 12 credits can be completed online at keepmecertified.com, a Missouri approved real estate school, for $44. Keep Me Certified is a Missouri Real Estate Commission approved real estate school, offering continuing education courses Missouri real estate agents need to renew their real estate license.